Should have written this post last week. I’ve been sick with a cold, but I did manage to walk down to Louise McKinney Park and the North Saskatchewan River to take pictures of the water, but that’s all I did. It was Tuesday, the day after it crested (Monday, June 24th), so it wasn’t quite as spectacular. On the Monday, the river overflowed the lowest path at Louise McKinney, the promenade, which would have been cool to see in person. 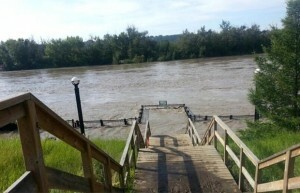 The following day when I was down there, the water had receded, but the stairs to the promenade were still blocked off. View from below the bridge. This area is normally dry. The river was indeed running very high, with lots of detritus, mostly wood. 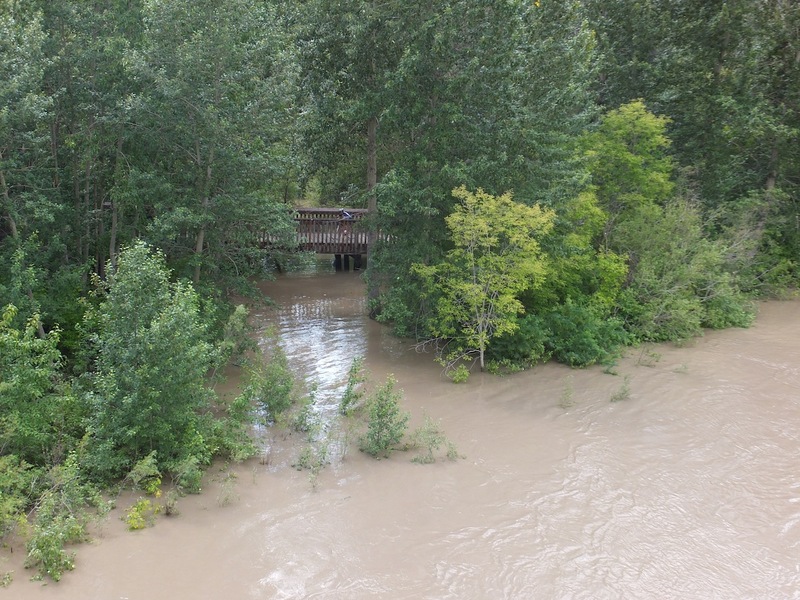 A high, fast river is not abnormal for this time of year, as the mountains unleash their winter cache, but combined with all the rain, it was higher than usual. I walked as far as the little bridge in Henrietta Muir Park, just on the south side of the Cloverdale Pedestrian Bridge, but no farther. The heat, my virus-heavy head, and the hanging tree caterpillars turned me around. 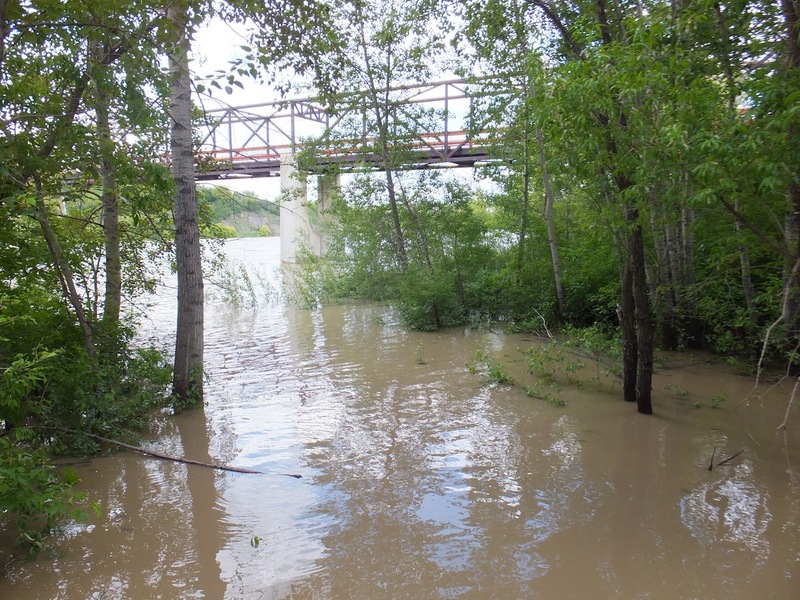 Nevertheless, the river was still flooding the banks, including all the ground below the bridge. As I’ve mentioned before in this blog, there is a canal in that area which runs under the little bridge into the woods. It’s a good gauge of water levels because most of the time it’s totally dry, but during these peak periods, it takes on water. The further up the canal, the higher the river. As of last Tuesday, there was no canal…just river. I feel sorry for all the little creatures and the birds who make their homes along the river banks, but I’m sure…even now, almost a week later, they’re rebuilding. Such is the resilience of nature. 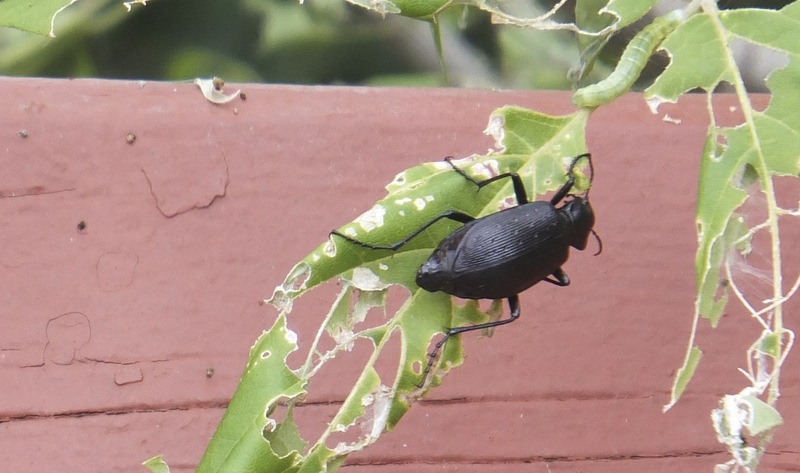 I did, however, manage to find this guy…a giant beetle…clinging to a caterpillar-ravaged leaf by the side of the bridge. Hope he made it.